Unlock the secrets of the ancient and mystical art of the Tarot and plot your path to spiritual growth with The Essential Tarot Book and Card Set. 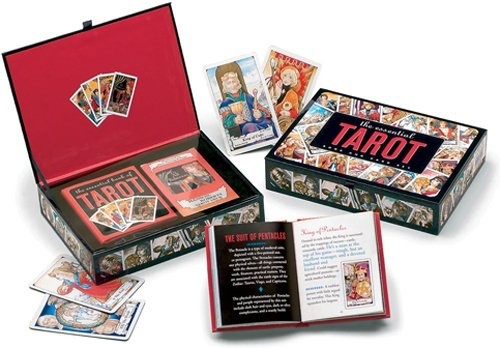 The classic Hanson-Roberts Tarot Deck and 112-page Essential Book of Tarot are packaged with a decorative storage box with magnetic closure. Follow the simple instructions in the guidebook to discover the meanings behind the mysterious imagery of the cards and learn how to conduct your own Tarot readings., The Essential Book of Tarot explains the fortune-telling elements of each Tarot card, as well as the history and lore of the Tarot.Rich, full-color illustrations by renowned artist Mary Hanson-Roberts adorn the book and each card in the complete 78-card deck. 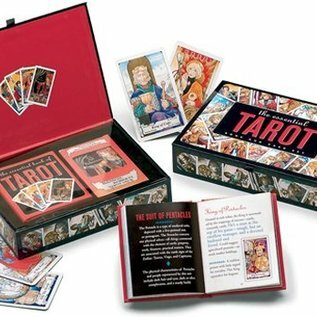 Her ethereal images, based on time-honored traditions, capture the spirit and soul of the Tarot.Attractive keepsake box features a ribbon tab, ribbon hinge, and molded tray in which to keep your book and cards.Beginners and established Tarot readers alike will enjoy this unique set.Set includes 112-page full-color hardcover mini guidebook with dust jacket, full deck of Tarot cards, and keepsake box.Box measures 7-1/2 inches wide x 5-1/2 inches high x 1-1/2 inches deep.A great value, wonderful gift, and superb resource for Tarot aficionados of all levels.